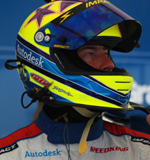 Autodesk has supported Russ Wicks and the American Challenge team since 2006. The team utilized industry leading applications for advanced 3D modeling, visualization, and collaboration to break several world speed records. Autodesk, Inc., is a leader in 3D design, engineering, and entertainment software. Customers across the manufacturing, architecture, building, construction, and media and entertainment industries-including the last 16 Academy Award winners for Best Visual Effects-use Autodesk software to design, visualize, and simulate their ideas before they're ever built or created. From blockbuster visual effects and buildings that create their own energy to electric cars and the batteries that power them, the work of our 3D software customers is everywhere you look.